However, the existence of triremes is completely incompatible with a 9600 BC date for the destruction of Atlantis as triremes were only developed around 9,000 years later. Triremes were built of lightwoods and were designed for a day’s travel at a time (50-60 miles) as onboard facilities were quite limited and could be easily beached at night. However, claims that these 45/50-ton vessels could be carried by as few as 140 men(e) is difficult to accept. Triremes were top-heavy and somewhat prone to toppling over in a violent storm and quite clearly were unsuitable for an ocean such as the Atlantic. Consequently, they were considered to be fair-weather vessels and were not generally used in winter(c). It is likely that Plato used the term trireme to make the story more relevant to his Athenian audience, by simply describing what was the state-of-the-art warship of his day. 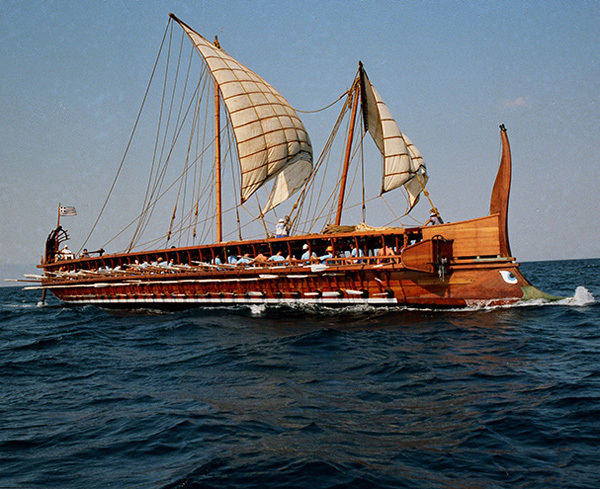 In 1987 a fullscale copy of a trireme, Olympias, was launched(a). The ship was due to visit New York in 2012(b). A book describing the construction and trialling of the Olympias is also available(d).